The time has come! Developed in tandem alongside last summer's Project Virtue (80mm A-4 Skyhawk), Project Bond was our codename for Freewing's first F-4 Phantom. With the 64mm and 80mm series stocked with recent aircraft from the Vietnam era, we set out to bring it all home with a big 90mm F-4. We know many of us have been waiting for the venerable Rhino to get the proper Motion RC treatment, and we know you'll enjoy flying the final result! 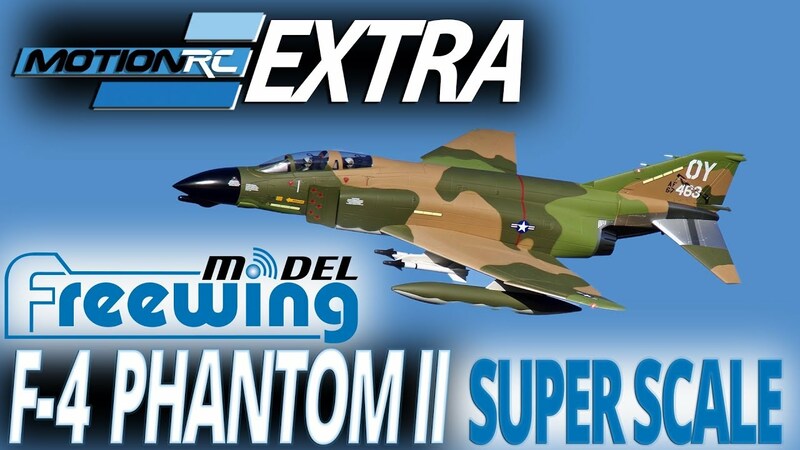 Aviation enthusiasts have long loved the F-4 Phantom, and Freewing and Motion RC are extremely proud to introduce our 90mm Super Scale Series rendition of this ultimate warfighter! For more than 50 years, the F-4 Phantom delivered the versatile capabilities required of an all-weather frontline supersonic interceptor, fighter-bomber, SEAD, and reconnaissance platform. Less than a year after its retirement from US military service, keep the F-4 Phantom flying in your RC fleet! RC fans have consistently requested a large F-4 in true PNP format that performs excellently out of the box without endless modifications. We developed this F-4 to deliver reliability, durability, and performance from your very first flight, supported by Freewing's parts availability and Motion RC's customer service should you ever need it. We can also confidently state that dependable grass operation is a hallmark of the Freewing 90mm F-4. With its wide stance, tall main tires, Oleo suspension nose strut and concealed trailing link suspension main struts, this aircraft performs well on rougher grass fields normally reserved for the Freewing A-10, Avanti, and other reliable "grass approved" EDFs. Failsafes were also designed into the mounting arrangement to minimize structural foam damage in the event of excessively rough landings beyond normal limits. The Freewing 90mm F-4's Super Scale details include accurate dual landing lights flush-mounted into the scale operating nose wheel doors, DayBright position lights, rivet detail, eight factory-painted colors, static arrestor hook, and period accurate ordnance comprising four AIM-9D Sidewinders and two 600 gallon fuel tanks. Copious detail is molded into the aircraft's surfaces without distracting from the overall scale effect, including recessed areas depicting Position 4 and 6 (where DIY modelers could add belly-mounted AIM-7D/E Sparrows). Plastic details include pitot tubes, ejection seat pull rings, and molded exhaust nozzles. The large fiberglass nose cone is magnetic and removable, and the chin pod beneath it is foam, allowing easy removable and customization for other versions (-C or late -D or other). An optional, highly detailed 3DPUP set ("3D Printed Upgrade Part") is available that represents the correct Mk H-7 ejection seats and cockpit instrument panels in high detail. Representing the famed aircraft BuNos 66-463 operated by pilot Richard "Steve" Ritchie and weapons systems officer Charles "Chuck" DeBellevue when they scored their fifth kill together on May 10, 1972 over Vietnam, the Freewing 90mm F-4 arrives pre-painted in classic SEA (South East Asia) Camo and proudly wears the markings of the 555th TFS. BuNos 66-463 became a bona fide "MiG Killer", being credited for six aerial kills with five different flight crews. The primary colors of the Freewing F-4 were based on color samples from a real F-4, obtained in person with our museum partner and then scaled appropriately for the model. For piloting wanting to customize their F-4 with their own scheme, we recommend Callie-Graphics.com for all your custom adhesive vinyl decal needs, and we worked with her to ensure her decal sets match our Freewing 90mm F-4's proportions. For customers wanting to touch up the paint of the factory paint job, or are customizing their aircraft with weathering or modifications like opening canopies, for color references, I used a brand called "MiG by Ammo". Credit to my good friend Levendis for his recommendation. The "MiG by Ammo" paints were surprisingly extremely accurate when put up against the real F-4 at the museum we used as a color reference (hands on, in person, I did it myself to ensure accuracy). The four colors are available here as part of a set. One set is enough to add the differential shading to the stock PNP colors, if you find that you want to simulate the paint fading I recommended about. Painting the entire model would require more paint, but again, as a top coat of shading, the set linked below is more than enough, and the point is for the paints not to be 100% exact, but 90%-ish to show a difference in age. I really like these MiG by Ammo paints. They're water wash up acrylics, like Tamiya. Odorless, very easy to use, and easy to shoot at 15-20psi with a 4:1 paint to thinner ratio, depending on distance from target and desired line thickness/attributes. Such a large RC model aircraft remains easy to transport with its magnetic removable fiberglass nose cone and removable wings with a convenient flexible wire harness that attaches at each wing root. Large flaps, brass ball links, reliable control hardware, and digital servos throughout the aircraft provide dependable control, and a specially designed elevator mechanism incorporates two ball bearings for smooth rotation at all times. The primary assembly of the entire aircraft requires only one epoxy joint. The Freewing 90mm F-4 Phantom II is available in two power system versions. The Standard version requires a 6s 5000-6000mAh battery, and is our top recommendation to pilots seeking the best balance between speed, thrust, and cost. The High Performance version requires an 8s 5000mAh battery, and delivers increased vertical climbing performance and acceleration. The High Performance version is recommended for Advanced pilots only due to the aircraft's higher speed envelope and heavier flying characteristics. Recognizing that much of the F-4's brute speed was a function of its powerful engines rather than a slippery aerodynamic profile, we incorporated several key design elements specific to the scaled down model to achieve the intended flight characteristics. The result is a suprisingly nimble and agile Phantom that penetrates well, lands slowly, and has excellent vertical performance. After years of waiting, the time has come! Own the biggest and best performing foam EDF F-4 Phantom in the world. Freewing has delivered another grand slam! Are you attending the Arizona Electric Festival this weekend? You chose wisely. Xplaneguy and Pilot Evelyn are there with one of these beauties nestled among their sizeable fleet, and they'll be flying all weekend. Stop by and let us know what you think! Special thanks to them and AceMiGKiller for fielding questions and collecting IOUs. Sorry, keyboard drool is not acceptable currency. Thanks to Pilot Evelyn, Bajora, Pilot Ryan and Co for providing the eye candy. We'll post painted up photos of the 3DPUPs soon, along with pricing. Enjoy this one guys! It's here! Woo hoo! I get to see it in person today at the AZ Electric Festival. Will takes lots of pics and video. Merry Christmas all over again everyone! Pre-ordered the ARF+ plus. Will be sticking a JF90 with a HET 700-68-1680 motor in it. Why no pre-order for the 8 cell? I am glad they finally got it out of the way !